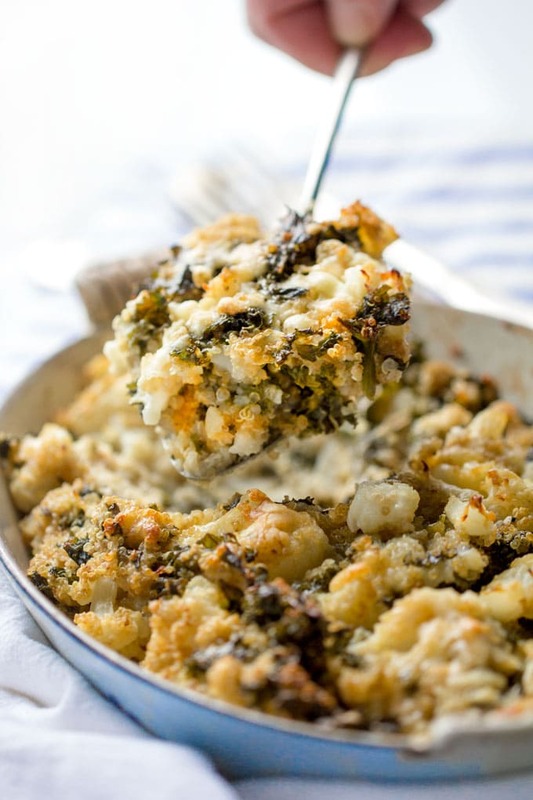 This healthy cauliflower casserole is made with loads of veggies and just enough sharp cheddar to make it taste like mac and cheese. Delicious guilt-free vegetarian comfort food is the best kind of comfort food! I’m a big fan of recipes that turn vegetables into crave-worthy comfort food. True comfort is greatly enhanced when you know that the dish you are enjoying is also good for you. I’m not averse to the occasional indulgence in all-out mac-and-cheese with noodles, creamy béchamel sauce and buttery breadcrumbs. It’s one of my favorite splurges. But for the regular dinner rotation it’s great to have a healthier recipe in the repertoire. And honestly, this dish is so delicious, once you try it you may never go back to mac and cheese. Cooked cauliflower is such a great ‘mac’ substitute, you might need to remind your conscience that you’re eating vegetables. And there’s no need for breadcrumbs here. The quinoa gets crispy and brown on top when baked. 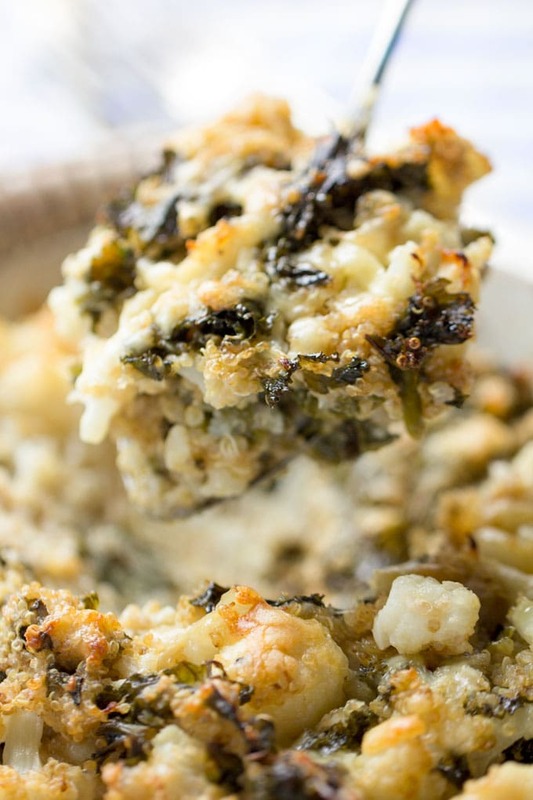 There’s plenty of ultra healthy kale in this cauliflower casserole, which also gets nice and crisp on top, and there’s just enough sharp cheddar to achieve a wonderful melted, oozing, cheesy deliciousness. Start by boiling quinoa in a large pot with extra water because you’ll be adding the cauliflower to the same pot. Cut a head of cauliflower into bite-sized florets. When the quinoa is half cooked, after about 7 minutes of simmering, add the cauliflower to the same pot. After another 7 minutes, drain the cauliflower and quinoa. Meanwhile, remove the stems from a bunch of kale. Toss the leaves with olive oil and roast them in the oven until they’re soft and crisp on the edges. In a big bowl, toss all the veggies with shredded sharp cheddar cheese, milk, mustard, salt and pepper. Pour the whole mixture into a casserole and bake for 30 minutes. 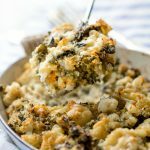 This Cauliflower Casserole comes together in about an hour, with only 20 minutes hands-on time, a great dish for weeknights! If you want to save even more time, you can do most of the prep a day ahead. 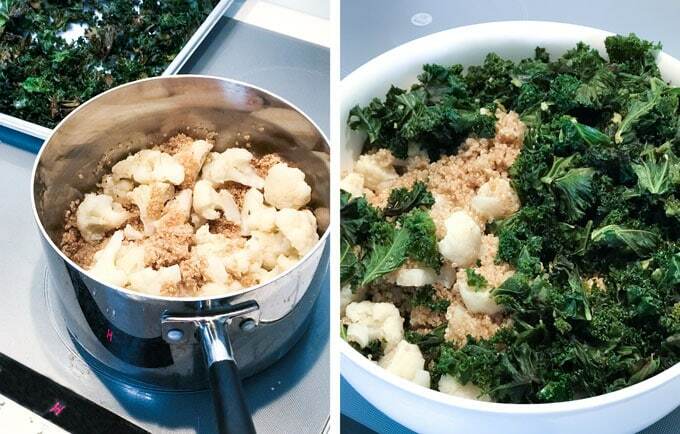 Cook the cauliflower, kale and quinoa and store them in an airtight container in the fridge. Just before baking, toss the quinoa and veggies with cheese, milk, mustard and spices. 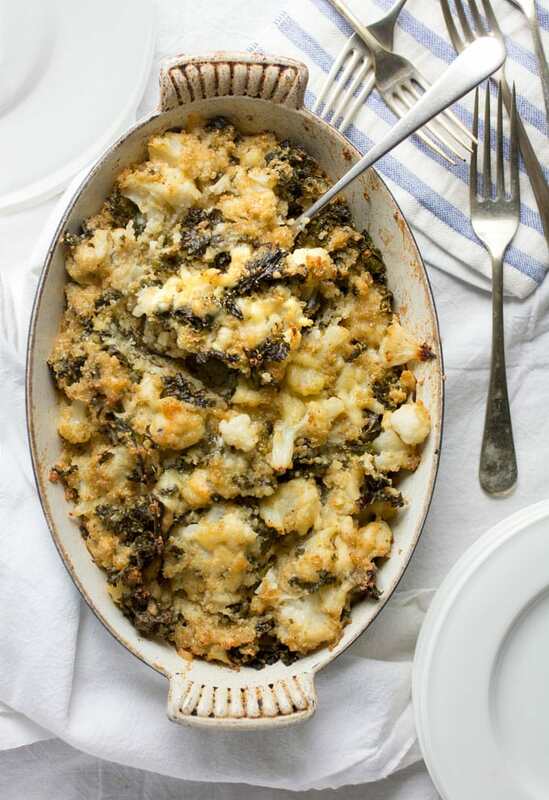 I’ve cooked this cauliflower casserole many times while testing the recipe and ended up with more than we could eat. So I threw a batch in the freezer and was pleased to learn that this dish reheats beautifully. If you want to freeze it, I suggest you transfer it to a freezer-friendly plastic container with a tight-fitting lid. 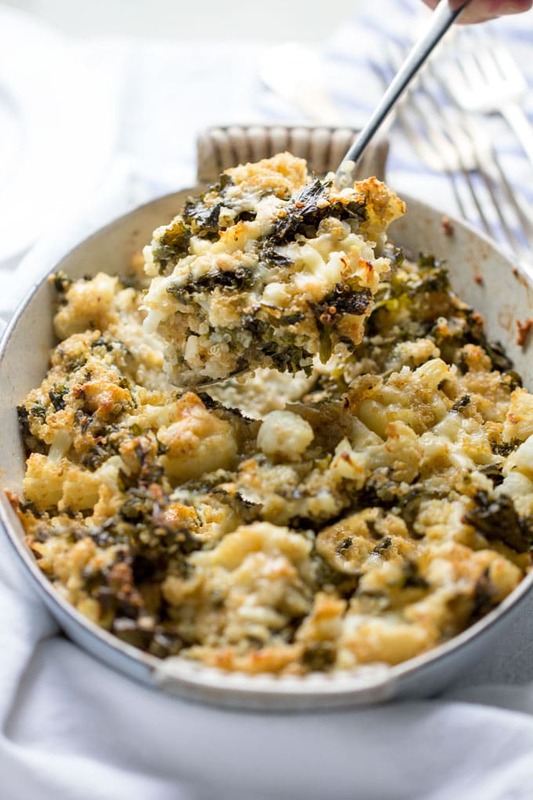 To defrost, pop the cauliflower casserole out of the container and place it in a heavy casserole dish. Warm in a 350ºF oven for 30 minutes, or until it’s heated through. Tent with foil if it starts to get too brown for your liking. I like to serve this with a simple green salad. It feels like a pasta and salad meal. 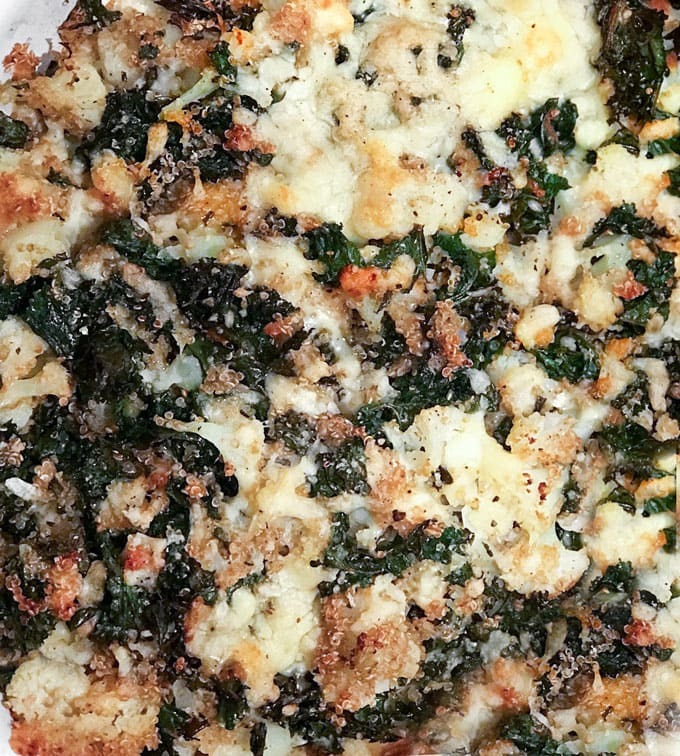 Here’s the recipe for Cauliflower Casserole with Quinoa Kale and Sharp Cheddar. If you try this recipe I hope you’ll come back to leave a rating and a comment. I’d love to know what you think. Preheat oven to 375ºF. Pull the kale leaves off the thick stems and tear them into bite sized pieces, rinse leaves, spin or pat dry (they don’t have to be completely dry) and spread kale leaves out on a large rimmed baking sheet. Drizzle olive oil over kale and use your hand to massage the oil into the leaves. Roast kale in the center of the oven for 15-20 minutes, tossing after ten minutes, until tender and crisp on the edges. Set aside. While the kale is roasting, put the quinoa in a large saucepan (large enough to hold all the cauliflower too) and add cold water so the pot is about 2/3 of the way filled. Turn the heat to high. Once boiling, turn the heat down to a gentle boil and set the timer for 7 minutes. When the timer goes off, add the cauliflower florets and once again turn the heat to high. Set the timer again for 7 minutes. Drain the quinoa and cauliflower and transfer to a large mixing bowl. Add roasted kale and toss. Add most of the cheese, setting aside a handful to sprinkle on top. Add the milk, mustard, 1 teaspoon of salt or to taste, 1/2 teaspoon of black pepper or to taste, and onion powder, if using. Toss well to combine. Turn the oven down to 350ºF. Transfer the mixture to a 2-quart casserole. Sprinkle with remaining cheese. Bake in upper third of the oven for 30 minutes or until the top is golden brown and crisp in spots. If you like the top to be extra crisp and brown, turn on the broiler for a minute or two, watching carefully to prevent burning. Made this last night to bring to Jane and Tom’s house. Easy and very satisfying! I used part skim milk and a mixture of skim mozzarella and sharp cheddar. If I had more time I would have added some buttered bread crumbs on top as a topping. Hi Alina! I’m glad you enjoyed the casserole. Buttered bread crumbs on top sounds divine! I made this and it’s delicious! From my toddler to hid grandpa, everybody enjoyed it! I used unsweetened almond milk instead of whole (bc that’s what I had) and sprinkled the top liberally with parmesan before popping it in the broiler at the end. I also finely diced some kale stems, a little celery, green onion, and carrot for color and crunch. I threw in some diced, sautéed chicken breast as well. I know I’m a deviant (lol) but I love this recipe. Thanks for sharing it! I would like to be able to pin this to try later. I don’t see anyway to do this! Help! Hi Janice. I think I can help. Make sure you’re on the page that has the full recipe (not the landing page, which has lots of recipes). Once you’ve clicked over to the page with the recipe, look under the title of the recipe – between the title and the top photo. You should see all of my sharing buttons there, including one with “P” for Pinterest. Click the “P” and you’ll be able to save the recipe to one of your boards. I hope that helps! Searching for kale recipes, I happened upon this and I made it this weekend. In fact, it sounded so good, I crossed my fingers and made a double batch and invited over a vegetarian friend to taste-test. 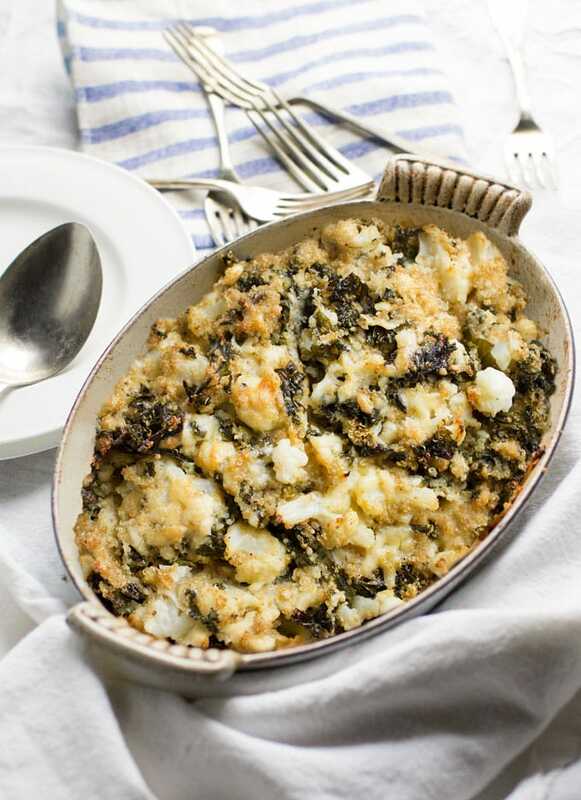 I’m a latecomer to kale, so the leaf-tearing felt time-consuming to me, but the end result was perfect: a hearty, balanced, nicely textured comfort dish that got thumbs up from my friend (as he dug in) and thumbs up from this slightly pickier eater. A+++!